Just in time for the Sonoma County Board of Supervisors' vote Tuesday on a $15-an-hour "living-wage," the National Low Income Housing Coalition (NLIHC) this week released its annual report, Out of Reach: Low Wages & High Rents Lock Renters Out Across the Country. The report comes as localities around the state and country grapple with a laudable national movement to raise the minimum wage to $15. The "Fight for $15" campaign was prompted in large part by President Obama's bully-pulpit push on the issue. San Francisco plans to phase-in minimum wage spikes so earners there are making $15 an hour by 2018; Los Angeles plans to do the same by 2020. Just this week, the California Senate put its weight behind a $13-an-hour state minimum wage (it's now $9 an hour and heading to $10; the federal minimum wage is $7.25). Sonoma County has failed to get on board yet. Problem is, $15 an hour is least $10 shy of what the NLIHC says is needed to swing the rent. According to the NLIHC study, California as a whole averages $1,386 a month for a two-bedroom apartment; Santa Rosa and Petaluma combined come in a little below average, at $1,370—but Sonoma County rents are on the rise, according to Real Facts, a Novato-based research firm. The latest data from Real Facts reveals that the countywide average is $1,624 for a two-bedroom. Using the California average, NLIHC doped out the math: To pay that rent without dropping more than 30 percent of your income on rent and utilities, you'd need to be making $26.65 an hour in the state. Napa County? You'll need to make $29.10 an hour to pay the $1,513 average for a two bedroom, according to NLIHC. 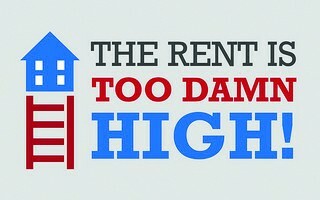 And Marin County workers need to earn $39.65 an hour to keep up with skyrocketing rents. For further evidence, go check out Craigslist rentals for a sobering dose of reality. Speaking of, Debriefer was cruising around the Bay Area Craigslist the other night and stumbled on a casting call for a new reality show called Best Bottle. The gist is simple enough; the program is "looking for established and aspiring winemakers who can prove they have what it takes to make an amazing bottle of wine." There are a bunch of eligibility requirements for Sonoma County winemakers, and respondents need to create a three-minute video and post it on YouTube. Fun! But the nameless producers also insist that respondents "cannot have a prior history of or currently receive treatment for substance abuse." Hmmm . . . The U.S. Equal Opportunity Commission reports that under the Americans with Disabilities Act, "an employer may not discriminate against a person who has a history of drug addiction but who is not currently using drugs and who has been rehabilitated."